Witch Hazel has cast a spell on the LOONEY TUNES characters to help her stop Bugs Bunny from finding the fabled "Treasure of the Old Castle." "Somewhere in the Old Castle, there's a treasure that will bring great happiness to its finder." The book stirred up Bugs' curiosity so he set off immediately to search for the treasure. --From the GBC Bugs Bunny Crazy Castle 3 instruction manual. 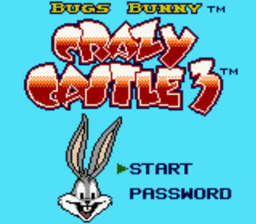 Play Bugs Bunny Crazy Castle 3 Now!